Famous English Bulldog Puppies with their celebrity owners bred by Stone Quarry Bulldogs! We are accustomed to meeting famous celebrities that purchase puppies from us. 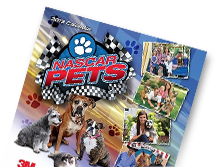 Watch the slide show below to see Nascar's Joey Logano with his beautiful puppy, and Tanyia Nayak from HGTV with her puppy Flynn! (We got to meet Tanyia on the set of a Family Christmas Special called Christmas Lights fight) And the adorable "Archie" with his owner Indianapolis race car driver, Jay Howard! Matilda (now Winnifred) was shipped to California to Dan Cory, head of Security for the San Francisco 49ers! The newest addition to our famous puppies list is Thaddeus and Bruno sold to JAKE FISHER of the Cincinnati Bengals! UPDATE... There is a new addition to the Pittsburgh Steelers football team as Roosevelt Nix has also purchased a puppy from us as you will see in our slideshow! We happily met him in Pittsburgh Pennsylvania with his new pup! We certainly hope we have more famous puppies with famous owners in the future! *Update! Our beautiful Boots puppies were chosen as baby puppy models for American Greetings Cards!